Give Your Property Quality Protection With Single Ply! As a commercial property owner, you want the best defense for your building. There are many options available out there, but single ply is by far one of the best choices for commercial roofing systems. These membranes are ideal for flat roofing systems and come in a variety of types, giving you the best choices for your building. Consider the following advantages of having a single ply system for your commercial property. Lightweight materials – Many roofing systems have to deal with a great amount of weight on them. This can compile from materials on the roof as well as heating and cooling systems. With a single ply roofing system, you can protect your property while lowering the weight of your roofing system. Easy Installation – Roofing installation can take a long time to complete. However, single ply roofing is easy and fast to install. It comes in large sheets and requires an insulator before installing. This means there is less material to apply on your roofing system. Quality Protection – The protection of your commercial property is the number one priority of any roof. Single ply roofing goes above and beyond for your building. It offers fantastic storm and environmental defense and even can safeguard your building against chemical damage. 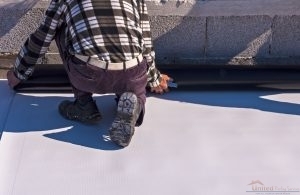 Aside from these, different single-ply roofing, such as EPDM, TPO, and PVC, all offer their own unique benefits as well. These can range from increased water resistance to improving your commercial property’s energy efficiency. There are many reasons why people choose single ply for their property. Want to get started? United Roofing Services is your source for quality commercial roofing in Grain Valley, MO. Call us today at 816-228-1158 to start your commercial single-ply roofing installation. Posted in Uncategorized on May 3, 2018 at 7:15 pm by United Roofing Services.